Poor Trulli. I mean, we knew someone was going to have to face up to the might of Karun Chandhok, but I do feel very sorry for him. Never mind, though, we must turn our attention to this next matchup - as we start to draw towards the end of round 1. 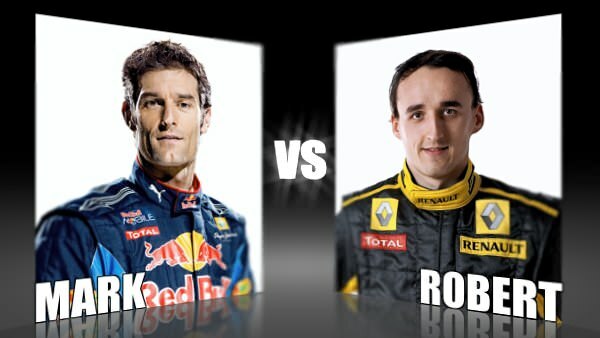 Today we've got the ever-honest Red Bull man Mark Webber, against the quiet but deadly Renault guy Robert Kubica. The Australian has been dominating headlines so far this year as he creeps towards being at the sharp end of the championship when it really matters. We know that he speaks his mind, and that he's not afraid to tell it how it is when it comes to the team treating him fairly. But how does that reflect on his character? He seems to be relatively easy-going, when things are heading in his direction, but he's been known for a bit of bad luck before. Kubica was quiet and consistent when he was at BMW, notable mostly for his "constructive criticism" on the radio to his mechanics. Now he's at Renault, he seems a little more relaxed and ready to come out of his shell - but have we seen much evidence of that yet? The fact that he plays poker has been spoken about endlessly and we know he is proud to be the only Polish driver on the grid. Will he get your vote today?